A remix for the German hip-hop artist “Kobito” which tells from his “here and now” experiences in the club About Blank and was released on well-known Hamburg based record label Audiolith Records at August 02nd. One week later, the “Shake That” remix for the new Act Sam Junk, debuting at Heinrich & Heine label Amber Blue Recordings. 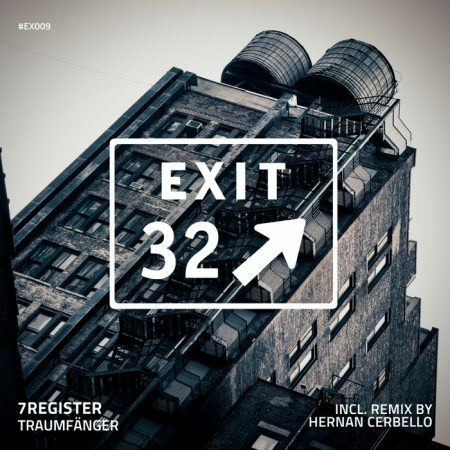 And now their own club track, which comes out on the fresh record label “Exit 32 Recordings” from Brooklyn, New York. „Traumfänger“ (dreamcatcher) says it all and tells from nocturnal dreams that each of us has almost each night. Like music which influences your feelings and mood, so to the native american symbol, which changes your dreams and protect you from nightmares when the sun rises in the morning. Let „Traumfänger“ filter out all the bad dreams, so only good thoughts can enter your mind. Contemporary sounds embedded in broadly rising pads and a pushing crisp kick, 7Register loves and stands for. Not to forget that they are especially pleased to present you a superb remix of Buenos Aires based DJ & producer Hernan Cerbello. An amazing interpretation, deep, groovy and full of warmness which has already found its way onto the roofs of New York. We like this next release from 7Register and hope you will love it too. This entry was posted	on Friday, August 19th, 2016 at 1:52 pm	and is filed under cutTheNoize. You can follow any responses to this entry through the RSS 2.0 feed. You can leave a response, or trackback from your own site.